The aircraft is a WWII-era Lockheed twin-engine PV-2 “Harpoon,” a land-based medium patrol bomber. 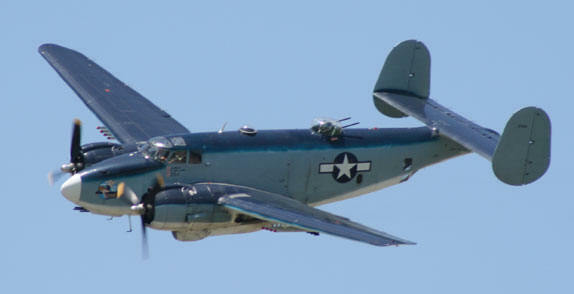 Known on the national air show circuit as "Hot Stuff,' it is also identified as serial number (Navy Bureau Number) 37396. One of a very few airworthy Harpoons that remain of the 600 that were originally built, Hot Stuff is a rare example of an oft-forgotten part of aviation history. Engines: Two Pratt & Whitney R-2800-31 air-cooled radial engines rated at 2000 hp for takeoff, 1600 hp at 11,900 feet. Maximum speed 282 mph at 13,700 feet, 271 mph at sea level. Cruising speed 171 mph. Landing speed 83 mph. Initial climb rate 1630 feet per minute. Normal range 1790 miles with six 325-lb depth charges. Maximum ferry range 2930 miles. Dimensions: Wingspan 75 feet 0 inches, length 52 feet 1 inches, height 13 feet 3 inches, wing area 686 square feet. Weights: 21,028 pounds empty, 33,668 pounds loaded, 36,000 pounds maximum. Armament: Two fixed 0.50 caliber machine guns in the upper nose decking plus three fixed 0.50 caliber machine guns in an under-nose pack. Two 0.50 caliber machine guns were carried in the dorsal turret, and two 0.50 caliber machine guns were installed in the rear ventral position. Eight 5-inch HVAR rockets could be carried underneath the wings. The internal bomb load was increased to 4000 pounds. The final development of the World War Two Lockheed twin-engine bombers, the PV-2 was among the most capable medium bombers of the war. Harpoons saw action with the Navy and Marine Corps all across the Pacific theater, from the Aleutian Islands in the north to the Solomon Islands in the south. Bureau number 37396 was accepted by the U. S. Navy in March 1945 and was assigned to Patrol Bombing Squadron (VPB)-136 in July 1945. The Harpoon was a slightly enlarged and improved version of its predecessor, the Lockheed PV-1 Ventura. The improvements included increased fuel-carrying capacity for greater range, an enlarged bomb bay to allow a greater ordnance load, and larger tail surfaces for better handling characteristics. Venturas and Harpoons were fast, well-armed, and capable warplanes. The Harpoon was mass produced at Lockheed Factory "A" in Burbank, California from March 1944 to September 1945. Navy and Marine Corps Ventura squadrons began transitioning into Harpoons upon their introduction in 1944. With an internal load of up to four thousand pounds of bombs, depth charges, aerial mines, or a single 22 inch diameter torpedo, plus eight five-inch high explosive rockets and another 2000 pounds of bombs on the wings, the PV-2 Harpoon could ruin the day for an enemy target. A total of nine 50-caliber machine guns completed the Harpoon’s armament. There were five guns in the nose, two guns in the top turret, and two more rear-firing guns in the tail-mounted “tunnel” position. The PVs also had one of the best airborne radar sets produced during WW2, the APS-3 radar, installed in the nose. With this radar, PV crews could spot something as small as a periscope on the surface from miles away. The radar also gave the PVs the ability to bomb from “above the clouds.” PVs were often used as lead ships, or “pathfinders”, guiding formations of non-radar equipped bombers to the point where bombs could be released. During the war, Hot Stuff was assigned to the US Navy’s Fleet Air Wing Four (FAW-4), which operated out of airstrips on Adak, Attu and Shemya in the Aleutian Islands off Alaska. Two FAW-4 squadrons had taken PV-2s into action by the war’s end. However, Patrol Bombing Squadron 136, to whom Hot Stuff was assigned, was still in the process of transitioning to Harpoons when the Japanese surrender occurred. Hot Stuff, like so many military aircraft that remain from the period, never saw combat, but she commemorates the combat history of the type. Hot Stuff, with the majority of the PV-2 inventory, was transitioned to the Naval Reserve at Naval Air Station Corpus Christi, TX, where she remained until 1953. When the type was stricken from the Navy rolls in 1953, the remaining Harpoon airframes were dispersed to foreign military services or sold as surplus. The four squadrons of Fleet Air Wing Four, termed the “Empire Express”, conducted near-daily bombing missions (using both Venturas and Harpoons) against the Japanese northern home islands—especially the fortress bases of Paramushiro and Shimushu—from 1944 till the end of the war. It was a mission that has largely been forgotten, but it was critically important. Over 15 percent of the Japanese air defenses were assigned to defend against these attacks on the Japanese homeland. That accounted for a great many Japanese airplanes, antiaircraft guns, and personnel who would not be available to defend against American operations farther south in the Pacific. This forgotten theater of the war had its genesis on June 3, 1942, when Japanese carrier-borne aircraft bombed the American installation at Dutch Harbor on the Aleutian Island of Unalaska. On June 6-7, Japanese Marines landed on Kiska and Attu islands in the western portion of the Aleutian chain—the only occupation of American soil during the war. The Japanese proceeded to construct airbases on Kiska, Attu, Shemya, and other islands. On the 11th and 12th of June, the United States counterattacked with slow-flying PBY Catalina flying boats and a squadron of B-24's. Air strikes continued until April 1943, when US forces re-took the Japanese-held islands in a bloody battle. In support of this operation, Fleet Air Wing 4 was assigned to the Aleutian front at Adak with four squadrons of PV -1 Venturas. In the fall of 1943, FAW-4 undertook the first in a long series of raids against the Japanese northern home islands, with a photoreconnaissance mission flown by a PV-1 Ventura from VPB-136—the squadron that later operated our aircraft. The 700-nautical mile route from the Aleutians to the Kuriles became known as the "Empire Express" and missions quickly changed from photoreconnaissance to bombing strikes in early 1944. The "Empire Express" continued with daylight and night bombing raids, using both models of PVs, until the end of the war. Hot Stuff ceased service with the U.S Navy and Navy Reserves in 1953, and was placed in storage at Litchfield Park, Arizona in February of 1954. Master Equipment Company of Cheyenne, Wyoming, (later Ralco) purchased the aircraft as surplus in 1957. From that time to January 1986, the aircraft served in an aerial application role, combating the spread of fire ants in the Southwestern U.S. In January 1986, the Historic Aircraft Memorial Foundation of Tyler, Texas purchased her, they removed the old spray gear and started the process of returning the aircraft to a military configuration. In 1989 the American Military Heritage Foundation acquired her and brought her to Indiana. Here the Harpoon was painted with the standard three-color WWII scheme appropriate for a land-based Navy plane: Navy blue on all the upper surfaces, sky blue on the sides of the fuselage and nacelles, and white on all the lower surfaces. The national insignia (stars and bars) is displayed on the sides of the fuselage and bottom of the right wing. The organization acquired and fitted a Martin 250 top turret, a component that had been removed and discarded by the previous owner, an agricultural-spray operation. The turret is a favorite feature of the plane among airshow attendees, and a popular in-flight seat among crew-members. The turret contains replica guns, but is non-operational. An ongoing project is to restore its functionality. Other ongoing restoration projects include re-fitting the radio operator’s and navigator’s stations in the cabin to their wartime configuration. In 2002, NOVA producers came calling on the AMHF. It seems they needed an aircraft that looked exactly like a PV-1 Ventura for their documentary, The Last Flight of Bomber 31. In this production, they were chronicling the story of an ill-fated PV-1 and it’s crew from their last flight to the discovery of their remains 55 years later. The scenes of the flying aircraft were shot using Hot Stuff as a double for the lost PV-1 The filming was done on a snowy morning at Mt. Comfort Airport, now renamed Indianapolis Regional Airport, which is still the home of our aircraft and organization, and the program aired on national PBS stations for two years. AMHF is a 501(c)3 non-profit corporation. In 2009, the aircraft was certified by the US Department of the Interior as a National Historic Landmark—a unique honor for a mobile artifact. The primary missions of AMHF are preservation of this rare historical artifact and education of the public about its historical significance, as well as—because of the aircraft’s association with VPB-136 and Fleet Air Wing Four—the larger history of the “forgotten war” in the northern Pacific. Our organization brings the plane to airshows across the country, where attendees are permitted to tour the plane and hear about the type’s wartime service. We also host school outings, and keep an open door for visiting groups to see our maintenance operations first-hand. We provided materials and information that formed the basis of a junior-high-level history curriculum in the Indianapolis Public Schools, and regularly host veterans’ groups—most notably this past year, the reunion of Patrol Bombing Squadron 148, a Harpoon squadron that flew out of the Solomon Islands during the war. Our organization also has a close, albeit non-monetary, relationship with the USS Indianapolis Survivors’ Association. That ship was torpedoed and sunk in 1945. Its crew of over 1200 had, just days before, delivered the components for the atomic bomb to Tinian Island. As the ship had been on a top-secret mission, it was not reported lost. The survivors of the sinking endured four days of horrifying conditions in shark-infested waters. Fortuitously, a patrolling PV-1 Ventura of VPB-152 spotted the remaining survivors in the water and initiated the rescue operation. The first aircraft to respond, coincidentally, was a PB5Y Catalina Seaplane piloted by Indiana native Adrian Marks. Marks landed, contrary to orders, and stayed until a rescue ship arrived. Only 318 men out of the Indianapolis’ original crew of 1200 survived the ordeal. In April 2011 we were awarded the Indiana Historical Preservation Award. We are registered as a Historical Artifact with the National Park Service and the Indiana Historical Society. The Geography Educators Network of Indiana (GENI) has developed a lesson plan on their Geography and History of the World (GHW) website at www. IUPUI.edu and has deemed it "Indiana's newest lesson plan.” Nova also has a basic curriculum on their website as a companion to the film "Last Flight of Bomber 31." Additionally, our aircraft was the subject of an article that appeared in the Australian magazine “Flightpaths” in 2009, describing the efforts of our maintenance force in replacing a failed engine and returning the plane to flight during the preceding two years. Our ultimate goals include as complete a restoration of the aircraft as is possible, as well as securing a permanent, weather proof home to protect her from the elements. Upon leaving Navy service, she was completely stripped of her wartime mission equipment Over the years, we have acquired and installed replacement components, such as the top turret, but much remains to be done before we realize our ultimate goal of restoring her completely. We have accumulated sufficient components to begin restoring the radio operator’s and navigator’s stations, but the necessary components for the radar operator’s station, tunnel gunner’s position, and the items that will fit out the main-cabin radio racks remain elusive. Due to its size, the aircraft has had difficulty in finding a home indoors. Because it has been located outdoors for its entire existence, a great deal of our maintenance effort is devoted to correcting the ravages of weather. Being outdoors twelve months of the year is hard both on the 65-year-old airframe and the not-much-younger maintenance force. Its 75-foot wingspan is far too large for most rental hangars. Obtaining a donated hangar of sufficient size to house the aircraft has so far proven impossible. Our goal is to obtain funding sufficient to either rent or construct an appropriate structure, which can also provide the necessary infrastructure for display of historical artifacts. The PV-2 Harpoon was a major redesign of the Ventura with the wing area increased from 551 ft² (51.2 m²) to 686 ft² (63.7 m²) giving an increased load-carrying capability. The motivation for redesign was weaknesses in the PV-1, since it had shown to have poor-quality takeoffs when carrying a full load of fuel. On the PV-2, the armament became standardized at five forward-firing machine guns. Many early PV-1s had a bombardier's position, which was deleted in the PV-2. Some other significant developments included the increase of the bomb load by 30% to 4,000 lb (1,800 kg), and the ability to carry eight 5-inch (127 mm) HVAR rockets under the wings. While the PV-2 was expected to have increased range and better takeoff, the anticipated speed statistics were projected lower than those of the PV-1, due to the use of the same engines but an increase in weight. The Navy ordered 500 examples, designating them with the popular name Harpoon.